With 112 nominations, Netflix overtaking HBO for the most nods "is a reflection of volume, and an emerging status quo," says Willa Paskin. Netflix aired 70 new shows during the nominating period, while HBO aired 20 new and returning shows. "Forget hours: to stay ahead in the prestige game, HBO’s bread and butter, it would seem to have make more series to keep up," says Pasklin. "But there’s another way to look at these numbers. HBO still has way more nominations per show than Netflix does: Of the 10 shows with the most nominations, HBO had three; FX had two; Hulu, Amazon, and Netflix each had one, which is another way of saying that Netflix got the most nominations because it had the most shows, not the best ones." 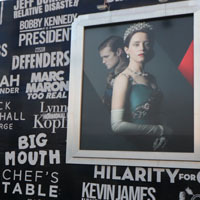 She adds that amid the "overkill" of so many potential contenders, Emmy voters glom on to stuff they could actually remember and start using "brands like HBO, Netflix, and FX to look for contenders. Unlike Netflix and the networks, HBO and FX aren’t trying to appeal to everyone, but in terms of reliably attracting attention for their series, they too are the new networks." Amy Sherman-Palladino, snubbed for Gilmore Girls, reacts to 14 noms for The Marvelous Mrs. Maisel: "Why are they letting me into the club?!" John Legend on a possible EGOT: "To do it with Andrew Lloyd Webber and Tim Rice would be especially cool"
Twin Peaks co-creator Mark Frost, who was nominated for writing, on major category snub: "External validation is a popsicle"
The Handmaid's Tale's Yvonne Strahovski on her first Emmy nomination: "I can’t stop smiling, my face hurts"